$25 for 2 tickets to The Cured Oct. 19th at Longshadow Ranch Winery! ($50 Value). $25.00 for $50.00 - $25 for 2 tickets to The Cured Oct. 19th at Longshadow Ranch Winery! ($50 Value). Are you looking for something fun for your next date night or night out with friends? If so, we have the deals for you! 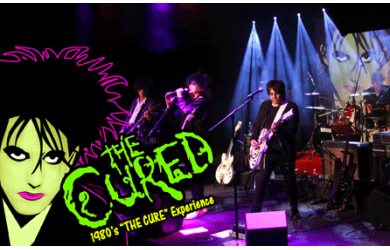 The Cured is a Southern California based realistic rendition of the 80's super band The Cure. The band performs a true to era 1989 Cure concert complete with costumes, lights, effects and of course the songs. The show was a hit from its first performance in late 2005. Word spread rapidly that The Cured was exceptional amongst the many tribute bands performing today. Almost immediately The Cured was playing in the largest and hippest club venues in San Diego, Orange County and Los Angeles. Don't miss out, grab this deals today! No Refunds Available. Ticket valid on 10/19/18. Not to be combined with any other offer. No Cash Value. Long shadow Ranch Winery has a 2 drink limit.